This is the workflow I am addressing and I'm looking for some feedback on the approach. Note: While the No Known vs. Unknown may be confusing, these options are clinically relevant so they can't be changed. 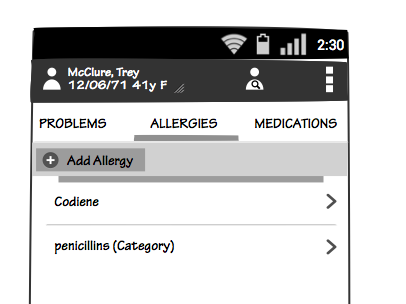 I'm proposing that the patient allergies screen shows these 3 options for the first view of this screen, when there haven't been any allergies added yet. 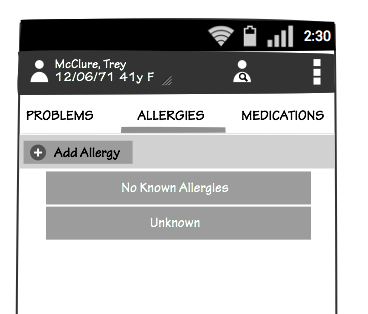 It would display these three options until the user either added the first allergy, or marked the patient's allergy as No Known or Unknown. Once an allergy has been added, I'm proposing that the other two options No Known and Unknown be tucked under the top of the screen. This is similar to the pull down to refresh flavor. Whenever the user returns to a screen that has allergies on the list, I'm proposing that these buttons display for a short period of time and then animate up with only a portion revealed as a reminder to the user that these will display. The user can pull down to access those buttons, but it will be rare that they would do that. 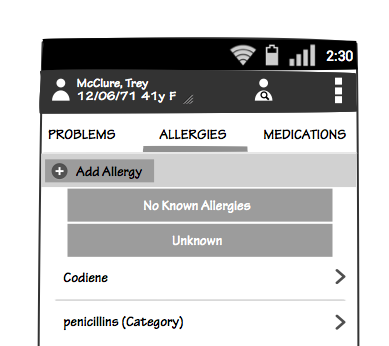 It's possible that the user would have an active list of allergies and then would need to be able to mark all items as Unknown or No Known. This serves as an undo mechanism in case they entered allergies for the wrong patient, etc. So these options still need to be available. However, this would be a rare scenario. My question is around the approach of hiding the less used buttons and whether that's a good idea. I understand the design principle of Visibility, but in essence I am providing visibility to these buttons at all times when you enter the screen. I don't think showing the buttons for a short time and then moving them is a good idea. You might put these (unlikely) options in the menu (always available in the menu) but have the buttons completely gone once an allergy is specified. But it seems to me logically inconsistent to allow an allergy to be specified and be able to specify "No Known Allergies" or "Unknown". Wouldn't it be better if you had to explicitly delete the allergies (and perhaps requiring an explanation as why you're deleting them) before you can set the state to "No Known" or "Unknown"? If you take this path, once all the allergies were deleted the "No Known" and "Unknown" buttons would reappear. You could move any actions that are performed frequently/infrequently up into the action bar, for example adding a + button next to the overflow when you are on the allergies tab. Anything you don't use often can be shifted to the overflow. I would leave the No Known button where it is, but move the Unknown to the action bar too to allow for quick sorting through records (one click in the action bar vs looking for the button). Once a patient has been marked as not having any known allergies this is unlikely to change frequently so you can leave this button where it is. As this is an Android app for 4.0 (judging by the interface) and above the user will be expecting functions on the action bar so it's not going to be too confusing for them. Not the answer you're looking for? Browse other questions tagged buttons android swipe or ask your own question. UX: Whats the difference between Save and Apply Buttons?